If you consider the songs on VOODOO CIRCLE’s new album "Raised On Rock" to be an indicator of the current emotional condition their most important protagonists find themselves in, there seems to be no reason to worry about band founder, guitarist and main composer Alex Beyrodt in particular. Thanks to Beyrodt’s excellent songwriting – as usual inspired by renowned sources such as Whitesnake, Rainbow, Deep Purple, Led Zeppelin and Jimi Hendrix – and his outstanding guitar performance which brings to mind icons from Ritchie Blackmore through Jimmy Page to John Sykes, this recording oozes pure, unadulterated fervour. This exuberant energy, however, isn’t the merit of Beyrodt alone but, without doubt, also that of his colleagues Mat Sinner (bass), Francesco Jovino (drums) and – last but not least – new vocalist Herbie Langhans (Avantasia). Beyrodt and Langhans met in 2015 at the Wacken Open Air, when they belted out the Wacken anthem together from the gigantic Black Stage. have suited his predecessor David Readman but are absolutely perfect for Herbie’s powerful voice.” The Voodoo Circle boss is referring to numbers such as ´Running Away From Love` with its anthemnic vocal melody and the subsequent midtempo rock track ´Higher Love`, which went down a treat with the audience at its official live debut. at the time. “The arrangement of the number was changed and overhauled repeatedly over the years, now it’s matured to the point where it was ready for recording.” ´You Promised Me Heaven` sees Beyrodt delve deep into the Page/Sykes bag of tricks, a veritable guitar festival featuring Telecaster, Strat and Les Paul sounds which support the bluesy feel of the track, adding even greater depth. can say that the new Voodoo Circle album truly lives up to its programmatic title. "Raised On Rock" will be available on February 9th as CD, Digipak and ltd. colored Vinyl. 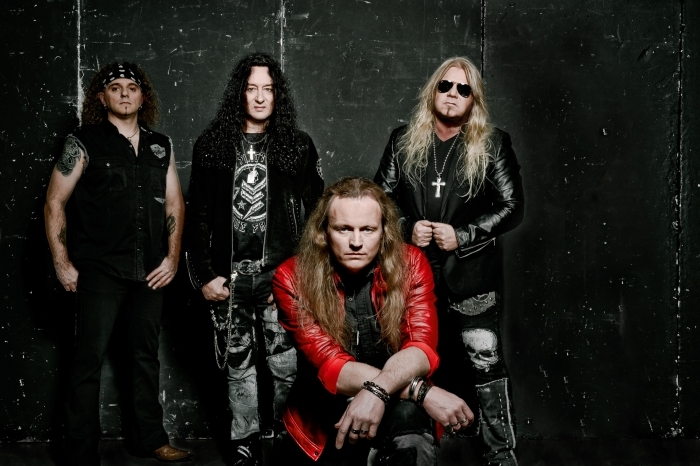 VOODOO CIRCLE, the classic hard rock band led by guitarist Alex Beyrodt, will unleash its highly-anticipated fourth studio album (titled "Whisky Fingers") on November 27th. The group just recently filmed a video clip for their new song "Trapped In Paradise". "Whisky Fingers" will be available as CD, Digipak, colored Vinyl and box set (incl. Digipak and whisky glass).